The Flag of Ownership … It’s too much fun. 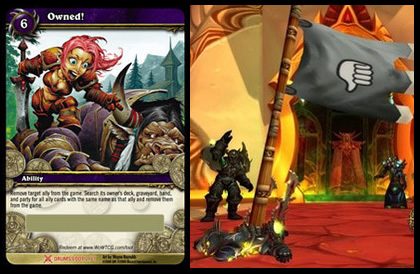 I haven’t used it a ton, but Flag of Ownership is a blast to use in battlegrounds or any other PvP situation. It plants a flag with the “Thumbs-Down” icon on it into your victim, and then announces that you’ve “Planted the Flag of Ownership into (insert victim’s name here)”. It’s a barrel-of-monkeys for sure. I still need to seek out a few new macros and add some new abilities to my keybinds, but I figured I’d post the setup I currently use. I have a zillion keybinds it seems, yet I still need to find room for a few more. 😐 In my opinion, Hunters have it pretty rough in that department. In PvP anyway, we have dozens upon dozens of skills and abilities we need to use at a moment’s notice. I don’t see how anyone could play a successful Hunter as a clicker. I “upgraded” to a mac from a Windows PC (LOL) this past summer and I play on one of those nifty aluminum imac keyboards. It takes some getting used to, but it feels very nice once you adapt to it. Prior to getting my new imac, I was on a custom built PC using a Logitech G15 keyboard. For those unfamiliar with the G15, it has 18 additional keys which you can assign macros to. The keyboard is absolutely incredible and offers somewhat of an advantage over other keyboards. If you play on a Windows machine, I highly recommend looking into one. ` (the key on the left of 1) – I’ve been using this key as my autoattack key for ages. I need to change it to something else more useful, but I haven’t gotten to it yet. To-do list item #1. 1 – Wing Clip / Raptor Strike Macro – I use this a ton. It clips and Raptor Strikes the target in one swipe. 2 – Mongoose Bite / Raptor Strike macro – I switch to this macro if the target is already clipped and I am unable to get range. 3 – Hunter’s Mark – I desperately need to change this to something more useful. I’ve had HM here since I started playing WoW. To-do list item #2. 9 – Aimed Shot / Kill Shot Macro – It casts Aimed unless Kill Shot is available. 0 – Targetenemy macro. This is my lazy targeting and anti-Rogue macro. It places a Mark on the nearest enemy, sends my pet at them, and starts me attacking. F6 – Volley – I may reassign this to a more PvP oriented skill. F7 – Rapid Fire – This I need to reassign as well. S – Pet return macro. This puts my pet in passive mode and returns them to me. V – Pet Aggressive / Pet Stay macro – This is my pet sentry macro I use mostly when defending in WSG and AB. The rest of my keybinds are the default ones. Like I said, I still have a few skills to bind, as well as macro in. I just need to get around to it. I also need to find out why my old modifier key macros are not working. All in due time. I’d love to hear some comments, criticisms and suggestions from other Hunters. Macro update is coming soon… I just need to pore through the Arena Junkies forums some more. Stocking stuffers comprised much of the gift giving this year at our household. We elected to focus on the children and keep the adult gift exchange to a bare minimum. One of the things my wife did was dump a few booster packs of WoW TCG Drums of War in my stocking. Although I’d never purchased any of these before, I did know about the tabards and some of the other cool things you can randomly pull from these packs. Being a former avid collector of Football and Basketball cards, I know a rare card when I see one. My all-time pull was an autographed Scottie Pippen card that was numbered out of 100. This was back in the day before ebay was king, and I sold it via an internet newsgroup for seven hundred bucks. While not as awesome as that, I came across a card that looked like it must be pretty special. I was right, because later on that day I Googled it to find that it sells for anywhere from fifty to seventy dollars on ebay . Whew… it’s been crazy lately. Aside from the few hours I was on Friday night, I haven’t been able to defend Azeroth much at all lately… Life is piling it on right now. WoW will always be there when time permits. I don’t really feel I’ll be too competitive for a few weeks anyway. I could use some gear upgrades, and I have yet to macro and/or keybind my new skills. Well, I guess I’ll see what I see if I’m able to log on tonight.